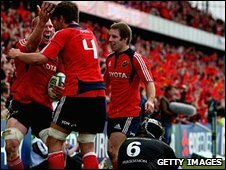 Holders Munster kept their formidable Heineken Cup home record with a huge quarter-final win over hapless Ospreys. Paul Warwick set the Irish on their way with a try and two mighty drop-goals, Ronan O'Gara turning the screw with a flawless kicking show for 17 points. The star-studded Ospreys managed three James Hook penalties before collapsing. Paul O'Connell crossed and Keith Earls added two tries within a minute as Munster set up a semi-final against Leinster at Dublin's Croke Park. The match will be played on 2 May, with all of Europe alert to the devastating form of the Heineken Cup kings. The Thomond Park crowd have only seen their team lose once in Limerick in the history of the competition, and that record never appeared in danger in front of another sold-out house. Osprey Tommy Bowe was playing as a makeshift full-back in the injury absence of Lee Byrne, and the Ireland Grand Slam-winner gave away a great attacking position when his clearance kick was charged down by Warwick. David Wallace powered over the line following the line-out, only to be held up by Andrew Bishop and Mike Phillips, but the Ospreys conceded a penalty from the resultant five-metre scrum. O'Gara opened the scoring with a simple kick, only to see the advantage cancelled out by a penalty from the restart, Hook opening the Ospreys' account from long range. The men in black were more often the villains in the book of referee Wayne Barnes, though, O'Gara landing a second simple penalty when the Ospreys went off their feet at a ruck. Hook missed with a difficult penalty chance before Ospreys number eight Filo Tiatia was sin-binned for a late shoulder charge on Warwick. Not to be outdone, Donncha O'Callaghan put in a late hit on Phillips, the Munster lock staying on the pitch, but the penalty he conceded allowing Hook to draw the Ospreys level. The 14-man visitors finally cracked, Lifeimi Mafi making the initial break before Warwick bounced out of Alun Wyn Jones' tackle in midfield on the Ospreys' 22. The full-back stepped opposite number Bowe and dived over under the despairing tackle of Hook, O'Gara converting under the shadow of the posts. Tiatia's return offered little relief, Mafi making a scintillating break down the left. The Ospreys scrambled desperately to save a try, but their clearance kick fell to Warwick who popped over a long-range drop-goal to make it 16-6 at the break. Hook clawed back a penalty early in the second half, Wyn Jones winning the position with tireless running to pressure Warwick. O'Gara cancelled that out with a penalty after another ruck infringement, before Munster got a helping hand from referee Barnes. Shane Williams wanted a scrum back in the Munster half when he grounded a rolling kick in his in-goal area with his own foot out of play, but was only awarded a drop-out 22. From that restart, Doug Howlett succeeded with the same trick in his own half, winning a scrum on the Ospreys' 22. Mafi spread the ball wide and, after quick recycling, O'Connell crashed over for a converted try. Warwick rubbed salt into the wounds with a huge drop-goal from inside his own half to take the gap to 29-9. Hook missed a penalty attempt, Munster firing back relentlessly as a huge forward drive saw Wallace held up over the line for the second time in the game. The Irish were not to be denied in the next phase, a delightful off-load in the tackle from Mafi seeing Earls over for the third try. Straight from the restart, Ian Dowling tapped down to Earls who sprinted 60m to claim a second try within a minute, O'Gara's superb conversion maintaining his 100% record. The points avalanche dried up in the final 10 minutes, but the result still represented a record European defeat for the Ospreys. Munster, playing their 100th Heineken Cup game in a record 10th successive season in the knock-out stages, will have their eyes firmly fixed on the final at Murrayfield on 23 May. "There's always something you can build on, but we're thrilled with that performance. "We won't get carried away with ourselves, but we'll enjoy it. "I don't think I struck the drop-goals that well, but it is something that I can add to the team. "We don't take anything for granted... it's a slow build-up [to the semi-final], but hopefully we'll get there on the day." "We're bitterly disappointed, it's hard to put it into words. "Munster were clinical and efficient, take nothing away from them, they'll go a long way in this competition. "We've got to pick ourselves up, dust ourselves off, and look onwards and upwards for next year." Munster: Munster: Warwick, Howlett, Earls, Mafi, Dowling, O'Gara, O'Leary, Horan, Flannery, Hayes, O'Callaghan, O'Connell, Quinlan, Wallace, Leamy. Replacements: Murphy for Mafi (70), D. Hurley for O'Gara (76), Stringer for O'Leary (67), Fogarty for Flannery (74), Buckley for Hayes (68), O'Driscoll for O'Callaghan (62), Ronan for Leamy (67). Ospreys: Bowe, Vaughton, Parker, A. Bishop, Williams, Hook, M. Phillips, James, Bennett, A. Jones, Gough, A. Jones, R. Jones, Holah, Tiatia. Replacements: Biggar for A. Bishop (60), Nutbrown for M. Phillips (74), Hibbard for Bennett (60), Griffiths for A. Jones (67), Levi for Gough (58), Lloyd for A. Jones (74), Smith for Tiatia (67).